For those of you without the time, energy, or attention span for the podcast, we present the video edition. 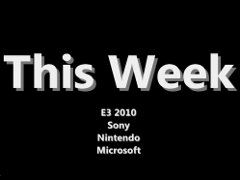 We are unfortunately one man shy this time, but with E3 and the flood of news it has brought there is plenty for Phawx and I to discuss. For PS3 we discuss the Move. Nintendo’s 3DS made an impression on us as well. Finally Microsoft gives us the Kinect to chew on. As always, check out the podcast for an hour of material that didn’t make the cut for the video.